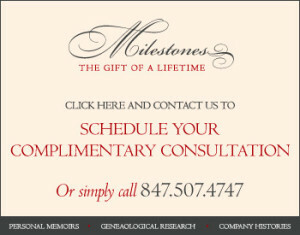 Memoirs written with a professional.Milestones, the Gift of a Lifetime, based in New Preston, CT will help you get started. If you are like most residents of Litchfield and Washington, CT you spend considerable time and money securing your assets for future generations. But the most treasured gift you can give loved ones isn’t your wealth. It is the story about your life and family history. In the relaxed setting of your Connecticut home, Milestones, the Gift of a Lifetime (www.YOURMILESTONES.net) preserves your words into a professionally edited account of your life. Bonnie Bell, MSJ, M.Ed, founder of Milestones, the Gift of a Lifetime, is a published journalist skilled in the art of interviewing. Based in New Preston, CT, she has more than 20 years experience in writing biographies as a correspondent for People Magazine. She formerly was a business reporter for Newsweek. Memoir Writer in Litchfield, CT. Bonnie Bell, former Newsweek and People Magazine and founder of Milestones, the Gift of a Lifetime, has ghostwritten numerous memoirs for satisfied clients. Give the ultimate gift to loved ones: the story of your life. 760.992.4374 or email bonnie@yourmilestones.net for a no obligation consultation.